With no fewer than 45 polls released since our last update, covering essentially all of the major swing states, we have a pretty good idea of where this race stands -- a far better idea than you'll get by trying to discern the meaning of John Zogby's divining rod or paying any attention to what you see on the front page of Drudge Report. What we can say, when we put all this information together, is that there are two things that John McCain is NOT doing. Number one, John McCain is NOT closing Obama's margin as quickly as he needs to (if indeed he is closing it at all). This appears to be a 6- or 7- point race right now ... that's where we have it, that's where RCP has it, that where Pollster.com has it. In order to beat Barack Obama, John McCain will need to gain at least one point per day between now and the election. Our model does think that McCain has pared about a point off Obama's margin -- but it has taken him a week to do so. Now, McCain needs to gain six more points in six more days. And he needs to do so with no real ground game, no real advertsing budget, and no one particularly strong message. Not easy. Number two, John McCain is NOT gaining ground in the states that matter the most. The top tier of states in this election are Virginia, Colorado and Pennsylvania. 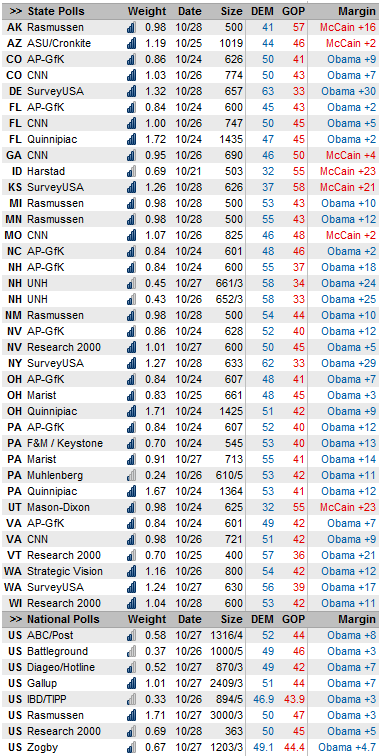 There is lots of lots of polling in these states, particularly in Virgnia and Pennsylvania, and it's all coming up in roughly the same range, showing Obama leads in the high single digits (in VA and CO) or the low double digits (in PA). The second tier of states is probably Ohio, Florida and Nevada. McCain seems to be getting a bit stronger in Florida; Obama seems to be getting a bit stronger in Ohio and Nevada. McCain does seem to have halted Obama's progress in some of the third-tier states, particularly Missouri and North Carolina. On the other hand, some other third-tier states, like New Mexico and particularly New Hampshire (where Obama is getting some insane numbers lately), now appear to be off the table. My feeling is that John McCain still needs some sort of external contingency to win the presidency. Even if some of the more conservative turnout models are correct AND even if he were to win large majorities of the undecided vote, he is probably a little bit too far behind to catch up. Rather, McCain will need to find some way to eat into some fraction of Obama's decided vote, and because most of Obama's support is quite hard (e.g. enthusiastic), that will not be easy to do.